Create beautiful decorative accents with Schluter®- QUADEC-FS Double Rail Strip Profiles. QUADEC-FS features a recessed section where field or accent tile is bonded. Also features integrated joint spacers that establish a defined joint cavity between the accent tile and the profile. Great for creating decorative accents on walls, chair rails and other decorative applications. QUADEC-FS can be combined with QUADEC finishing profiles. Great for creating accent fields on walls, chair rails, and more! Cleans easily with common household cleaning agents. Note: Do not use abrasive cleaning agents. I am interested in the QF8/50ACG and/or the EV/QF8/50ACG. I�m not sure which of the two I should be using/purchasing. I want to use this instead of a bullnose for the tile in my bathroom. I just want to be able to add this piece along with the decorative tile that goes inside of it to the edge of the tile that is already on my walls. I can�t seem to find a picture of what the �Inside/Outside Corner� piece looks like in order to figure out whether I need to order that piece. Also, how many inches is the space between the metal trim? I want to figure out what decorative tiles to order for it. Create beautiful decorative accents with Schluter®- QUADEC-FS Double Rail Strip Profiles. QUADEC-FS features a recessed section where field or accent tile is bonded. 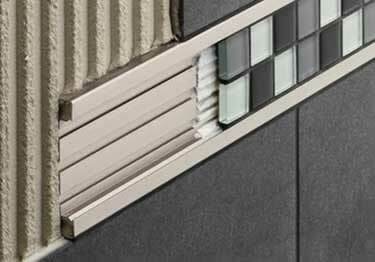 Also features integrated joint spacers that establish a defined joint cavity between the accent tile and the profile. Great for creating decorative accents on walls, chair rails and other decorative applications.